I know summer’s almost over, the past week has been nothing but bad weather. Yesterday we were on our way home from a friend’s birthday, it was still 8pm but the sky was like nothing like I’ve ever seen, black on one side with a flash of lightning every 5 minutes. We thought where did the summer go? 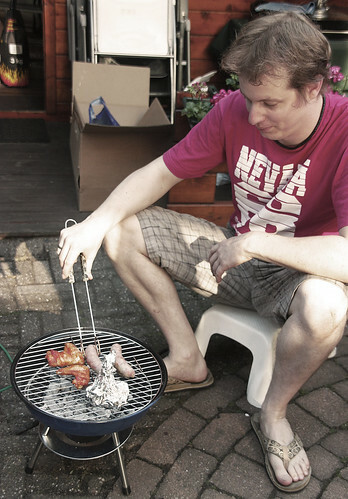 But anyway we could still enjoy summer from these photos when we BBQ-ed couple weeks ago. We made some simple BBQ of vegetable satay (mushroom, onion bell pepper), shrimp, sausage, chicken wing, salad and not forgetting very easy yet delicious grilled potato. I’m going to share the recipe for the grilled potato here, though it was not an extravaganza but it was so good I had to share it with you all. I don’t know whether it was because it was grilled potato or the spices or the final touch of sourcream. Anyway lets enjoy this grilled potato and the rest of the summer before it’s gone before your eyes. For all of you who are interested in joining MasBar do stop by at our site. – Wash the potatoes but don’t peel them, when they are cleaned prick the potatoes with fork. – In a bowl mix olive oil, salt and rosemary and rub the mixture on the potatoes. 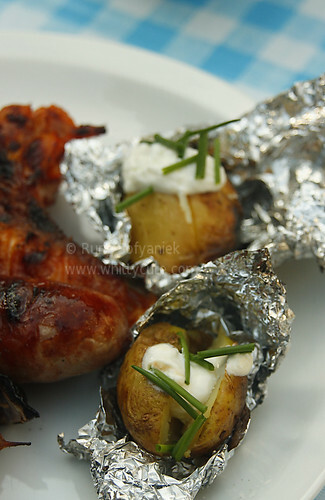 Meanwhile cut 8 squares of aluminium foil and wrap the potatoes individually. Pour the remaining olive oil mixture in the potato package. 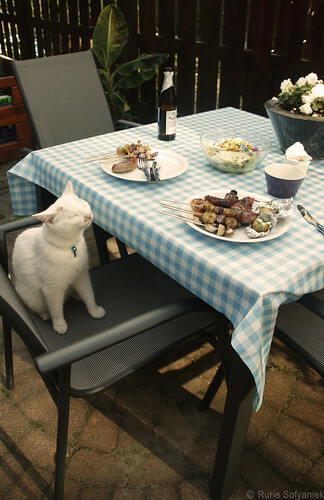 – Baked the potatoes straight inside the BBQ for 20 minutes while not forgetting to turn them once a while. Glad to have you on board! Should you have any recommendations kindly please inform me and I would include it in my list along with some comments. 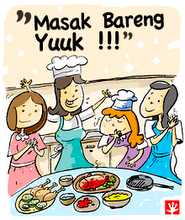 The criteria is simple; it must contains writings on Indonesian food, and is done in English.